Quisqualis indica also known as the Chinese honeysuckle, Rangoon Creeper, and Combretum indicum is a vine with red flower clusters and is found in Asia. It is found in many other parts of the world either as a cultivated ornamental or run wild. Other names for the plant include Quiscual (in Spanish), Niyog-niyogan (in Filipino), Madhu Malti or Madhumalti (in Hindi) and Radha Manoharam (in Telugu). arrangement is opposite. 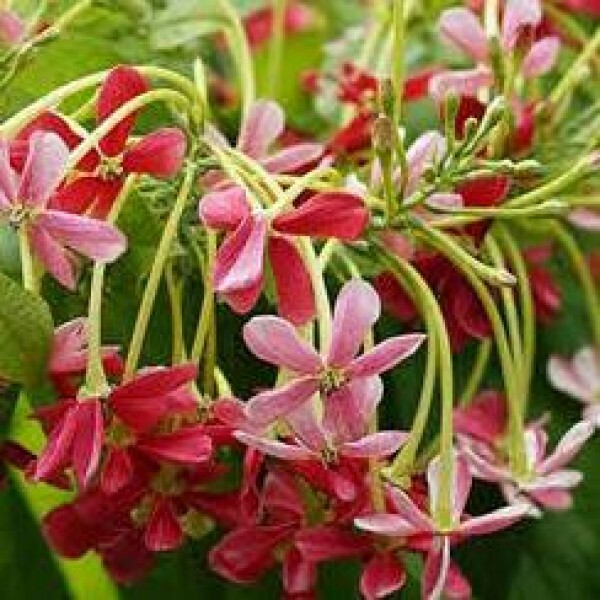 The flowers are fragrant and tubular and their color varies from white to pink to red. The 30 to 35 mm long fruit is ellipsoidal and has five prominent wings. The fruit tastes like almonds when mature. The niyog-niyogan is usually dispersed by water. Rangoon Creeper is found in thickets or secondary forests of the Philippines, India and Malaysia. It has since been cultivated and naturalized in tropical areas.